By the time January rolled around, I had been begging to drive a giant, 12,000-pound Monster Jam truck for six months. When someone finally gave that idea the go-ahead, it was surreal. As if the reality of my longstanding request hadn’t hit me before then, I realized that I actually had to drive one of these things. Then I got nervous. Very nervous. 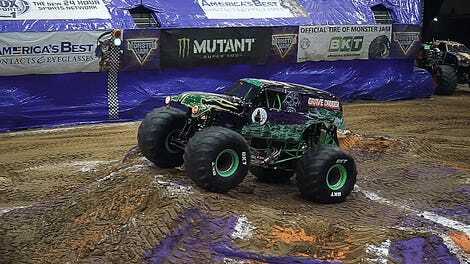 Monster Jam is, of course, the wild live motorsports show with giant trucks that jump over dirt mounds and crush cars in front of thousands of people. It’s been around for more than 25 years now and it’s wonderful, which is why I wanted to try it out so badly. But when the time came, I had some apprehension. That feeling never really went away, no matter how comforting it might sound to stand next to tires that are nearly taller than you are or to crank a five-point harness down as tight—no, tighter—than it can go as you sit in a truck, staring at unfinished jump ramps that look like mere ripples in the dirt from a cockpit that takes a ladder to reach from the outside. Then, there are the switches and knobs to start the Monster Jam truck up, which all look frustratingly similar yet terrifyingly mysterious (What if this is an eject button, or if someone accidentally put an “explode” switch into this thing? ), which do a great and thorough job of easing the nerves once you climb in. Totally. Things would have been a whole lot harder had I not been given the rundown on what to do and when to do it from Megalodon driver Alex Blackwell, who let me drive his truck. His truck, conveniently and not terrifyingly at all, is named after a giant, prehistoric shark that National Geographic reports grew to over 50 feet in length and had a powerful enough bite to crush a car. Nope, not scary! Blackwell walked me through how to keep the hulking, 1,500-horsepower truck on the ground and out of any walls, and I got a few tips from Grave Digger’s Adam Anderson as well—he was less hands on, understandably, since the fate of his truck wasn’t in my hands. They basically told me to hit the gas and try not to hit anything else when I did, and that someone would stand by with a remote ignition interrupter, which Monster Jam uses during its shows to shut trucks off if they get into an unsafe situation, in case I needed it. It would take days to talk about everything I learned behind the wheel of that truck, but the most surprising part was that I felt a lot more in control than I ever expected. Like Blackwell, I got out of my short time in that monster of a machine truck wanting nothing more than to get back in. Monster Jam is incredible from the outside, but to sit inside one of those trucks and have dirt fling into the cockpit like you’re running a giant, haywire, shark-shaped lawnmower—it’s a completely different level of incredible. As was the fact that I didn’t eat a wall in it, honestly, because these trucks never stop looking hungry.